Cat tail wagging is far more complicated than dog tail wagging. There are different cat tail wags that mean very different things in cat language. Humans usually associate the action of “tail wagging” with dogs. Canines are fairly straightforward with their tail communication. Cats, however, are way more subtle in their body language and cat tail wagging is very nuanced. 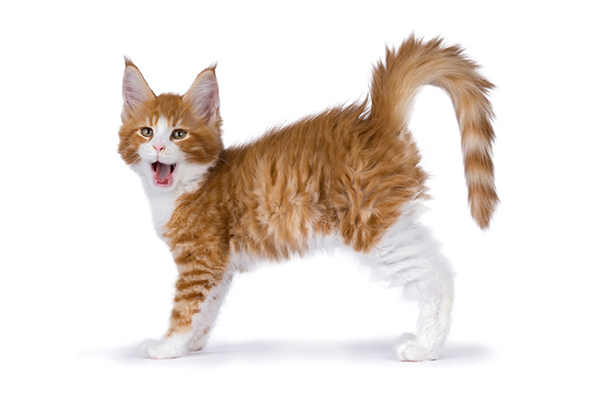 Marilyn Krieger, Certified Cat Behavior Consultant and author, says, “Although tails are expressive, eyes, ears and body positions combined with the tail language paint a more complete picture of how cats feel.” Cat tail wagging can mean many different things. 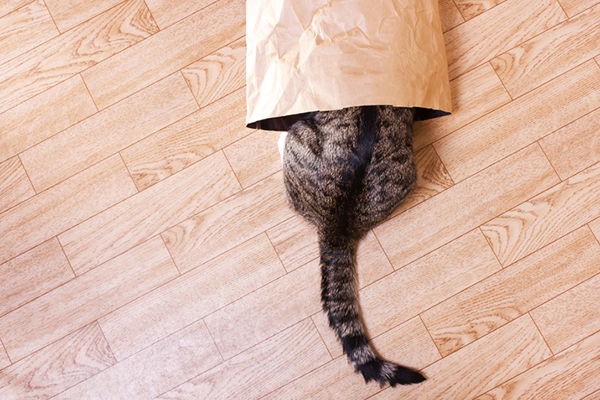 Here’s how to decipher the messages sent by cat tail wagging! A cat thrashing his tail means he wants to be left alone. Photography ©Alexmia | Thinkstock. 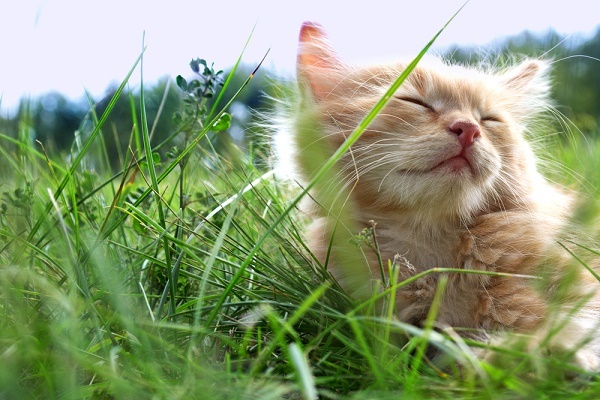 Marilyn Krieger advises, “The direction and speed [with] which cats move and swish their tails conveys their feelings. When felines thrash their tails quickly back and forth, it indicates that they are unhappy and want to be left alone. Tails that move slowly from left to right often indicate that cats are mildly annoyed. Sometimes, cats who are playing will swish their tails from side to side before pouncing.” This means we should pay attention to the way our cats swish their tails and not make assumptions. A “quiver” is a quick, tiny cat tail wagging action. 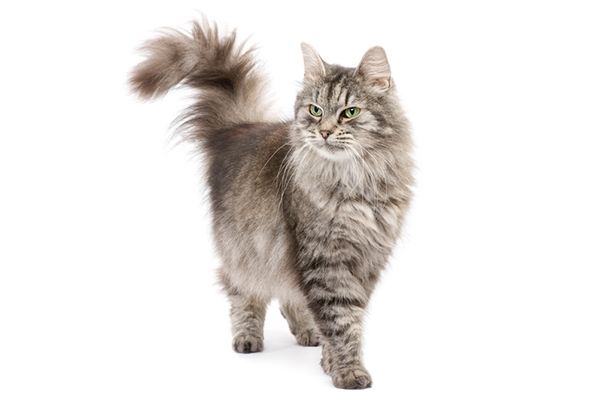 When your cat is excited to see you, she may approach you with her tail in a vertical position, with just the tip of it making quick, little quivering motions, similar to a rattlesnake’s tail. Unlike the snake’s warning signal, a quivering kitty tail is a welcome sight and is typically accompanied by purring, face rubbing and sometimes even happy vocalizations. Return the greeting, even if you can’t quite do the tail-shaking thing. Unlike dogs, who are more than happy to come when called, cats like to mull over the situation and decide if we’re worth their time at that exact moment. When food is involved, there’s typically no question — all they have to hear is the pop-top of a can and they race into the kitchen like a baseball player sliding into home base. This type of cat tail wagging is actually a sign of contentment because your cat is telling you that she feels comfortable remaining asleep in your presence. The bottom line, however, is that cats are going to do everything on their terms, which is no surprise to anyone who shares their lives with a kitty. 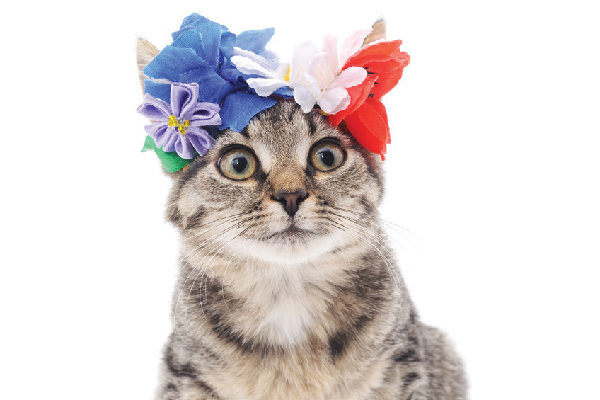 Paying attention to how your cat wags her tail will help you better understand your kitty. Photography ©Nynke van Holten | Thinkstock. A cat’s tail is really a barometer for her feelings. Cat tail wagging is a way to communicate those feelings with us, but we must consider the entire picture, including non-tail body language and overall demeanor, before accurately interpreting it. When we learn to read the messages our cats are sending us, we will respond accordingly and develop a trusting, respectful relationship with our beloved felines. My tuxedo kitty Stella jerks her tail back and forth all the time! At first I thought it meant that she was always mad about something, but soon I realized it was her normal habit, like a human’s “resting face”. Goes to show that cats are all different, just like people. My cat rarely wagged when he could come and go as he pleased , but now I have moved and he has to stay indoors or in an enclosure unless I am outside keeping a close watch and he is flicking his tail tip really fast Do you think he will eventually settle. Should I just keep him inside and in the enclosure???? We have 5 distinctive different color and fur coated cats; an older, female (spade) grey long, furred cat , we call “Grey Grey”, who birthed and mothered our “Boots”, her youngest litter, “Tuxedo” type of long furred cat; “Spots”, a short-white furry cat with 3 black spots on his back & a partial black face and black tail; a younger short-furry Calicao we named “Phoebe’, and a short-fur, light gray, soft, fur cat we call “Sheba”. They all have different tail-wagging behaviors we’ve noticed. Boots does the “swishing” tail type, except when he comes on our couch and sits between me and my husband and gets a few bits of his Temptations treats, he’ll wrap his tail around my head when I snuggle up to him as if he’s returning the snuggle. Spots had indicated a few times the stiff, up in the air motion type, of his tail at times when he’s been outside at long periods and comes in the house to cool off, he seems to do that. Spots also swishes his tail at us when we praise him and tell him we love him, as it looks and seems he is responding to that stimulus. The younger cats, Phoebe & Sheba, especially Sheba, express their tail wagging with us in the ways this article explains, and Sheba seems to like wrapping her tail around us both when she wants attention, we’ve noticed. Our oldest friend, Grey-Grey, mother of Boots, doesn’t do the tail swishing as much as the others, but she responds to us very well in other aspects like rubbing up against us around our legs expressing her gratitude to us with her face rubs, or bunting, too. All in all, we respond to their different “tail wagging” behaviors to their own individual types of communicating to us every day. My Bengal cat, Sandra, uses these tail wags. It’s kind of funny how you listed all of them. She likes to sit on our windowsill during the afternoon and watch the animals outside. (She’s a strictly indoor cat) It’s kind of funny how she even paws at the window trying to catch the animals. During the late evening, She goes back to sitting on the windowsill after her dinner. (She really does only eat 3 times a day at human appropriate times but water is provided 24hrs) This time, She watches the sky. She just ignores the nocturnal animals who sneak in our yard. She watches the sky but gets scared away when a plane flies by. She has a bed, but she sleeps on the windowsill. She uses her bed for daytime naps. Which I guess is OK.
Our cats “hug” us with their tails when they are happy. It always warms my heart to get a tail hug. Catster, you are so helpful. When I take my cat outside in my arms which is a treat he wags his tail when I get him. I always thought that meant he was happy. I still think it does under this circumstances. Ok, this all sounds great except I have Manx cats LOL no tails. All cats are different. Some of these may have some truth. But it all depends on your cat, the environment and the kind of attention they get. Hi there — We would suggest taking your cat to a vet ASAP. Best of luck, and hope your kitty feels better. My cat’s tail is seldom still … it always seems to be flicking even when I am petting him and he is purring very loudly and obviously very happy. He often “beats” me with his tail even when he is snoozing. The only time his tail seems to still is when he is fast deep asleep. Our cat Chert has a very active tail that many people find difficult to interpret as her style is somewhat individual. For instance, most people take the tip-of-the-tail wag for a sign of annoyance, but she does it when she’s happily being petted, purring loudly. She also crooks and gently wags half her tail when she wants attention. Just goes to show you really have to pay attention to a cat’s tail. You really need to meet my current show boy Castor – his tail is ALWAYS going..I thought it’s him scheming..